The following is the first of a continuing series of photographs of my plot (number 13) at the Rolla Community Garden (RCG), located behind the Rolla Recycling Center on Old Saint James Road. As the Spring and Summer go, we will see how it grows. Plot 13 is available for anyone at the Fellowship to use. 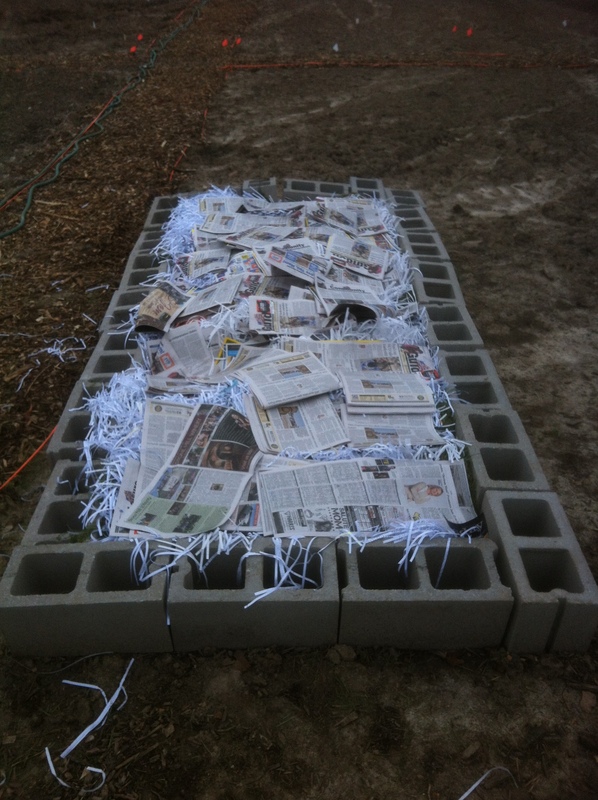 We are using a technique called lasagna gardening, in which layers of organic and every day materials are used to create rich soil to grow food in. Misty did this last year with her gardening at RCG, and her results were very impressive. 1) To help popularize lasagna gardening, so that people learn that they can grow productive and pretty vegetable gardens in their lawns without spending a lot of money. Lawn grass is the number one crop grown in the United States today. That’s a lot of land, water, and soil used just for grass. We hope this plot demonstrates how folks, particularly folks without a lot of money, can still have pretty lawns and grow nutritious food to supplement their income, particularly folks without a lot of money who often have less access to higher-quality food. The garden will be pretty because it will be surrounded by lovely flowers that naturally help deter pests. 2) To grow food to donate to the Russell House, which is the local domestic violence shelter in our area. Full disclosure, this is my first time trying lasagna gardening. I am not an expert. I am just trying and doing my best. I had the grey blocks left over from last year. It is to help make a raised bed. There is tomato cage wire laying flat on the ground to help discourage moles and the like from coming up and eating plants from underground. 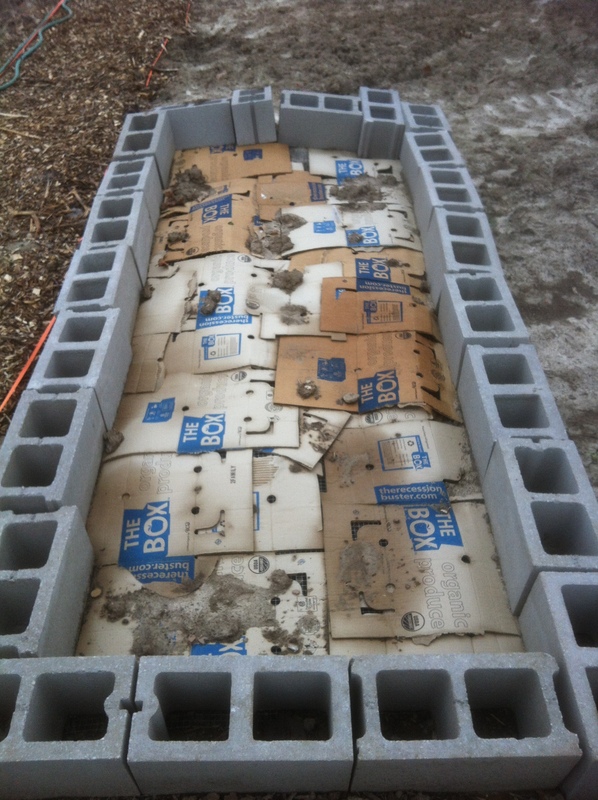 The card board is literally worm food. Earthworms love, LOVE card board. It is 100% recyclable. It is good to have this as a first layer. This card board is just left over from the produce boxes I get from Nature Girls. 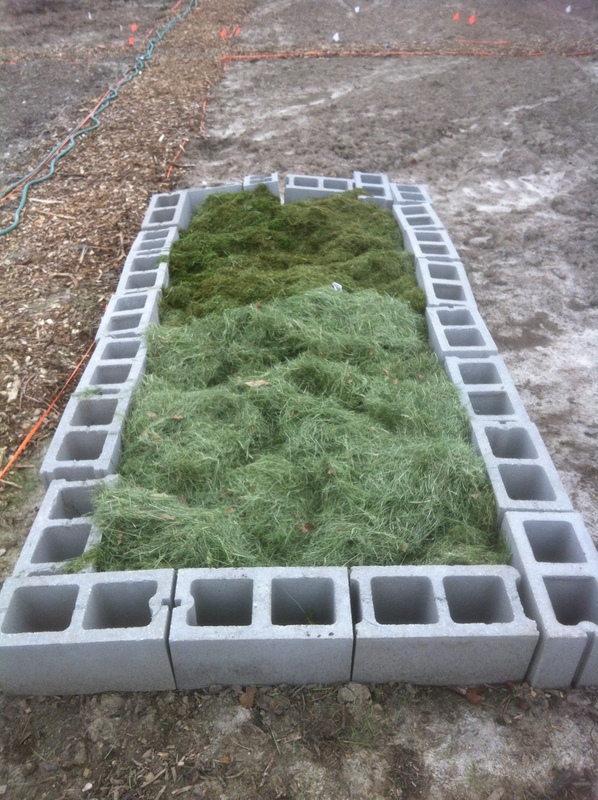 Tom donated five bags of lawn grass. Thanks Tom! 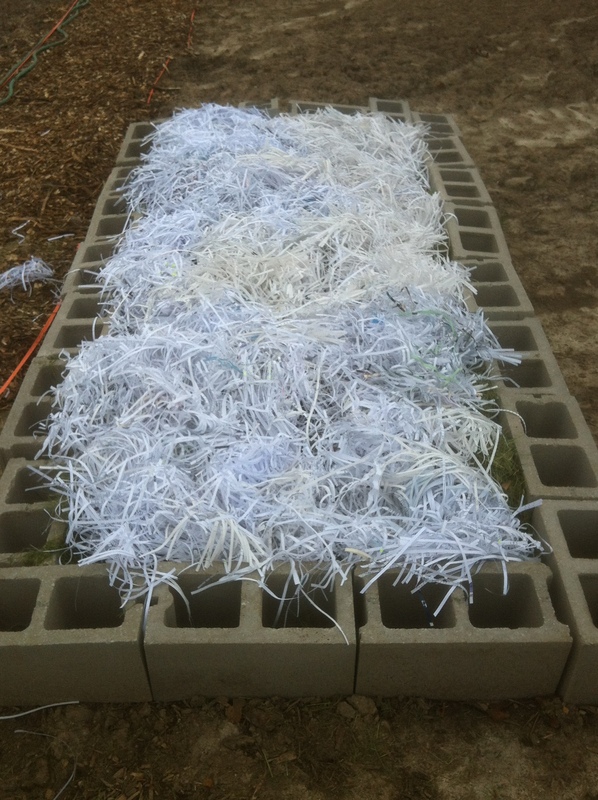 Shredded paper helps make a good layer for decomposition. We will keep you in the know as the garden grows. If you would like to help or have friends who might like to, please feel free. The more the merrier. The city of Rolla is offering the use of free water for RCG. Keep this in mind, as it is a big plus.